Troop Groovy Girls Now Available! Girl Scouts and Manhattan Toy Company have teamed up to design Camp Groovy Girls, the latest offering in the wildly successful Groovy Girls line. 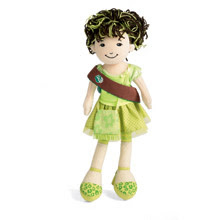 This critically-acclaimed product line of dolls and accessories is inspired by the Girls Scout mission to build girls' of courage, confidence and character who make the world a better place. Camp Groovy Girls are available for purchase at select specialty retail outlets, Target and through Girl Scouts Council shops .